This formula contains a balanced complex of vitamins and hormones which provide the necessarystimulants for healthy orchid growth. 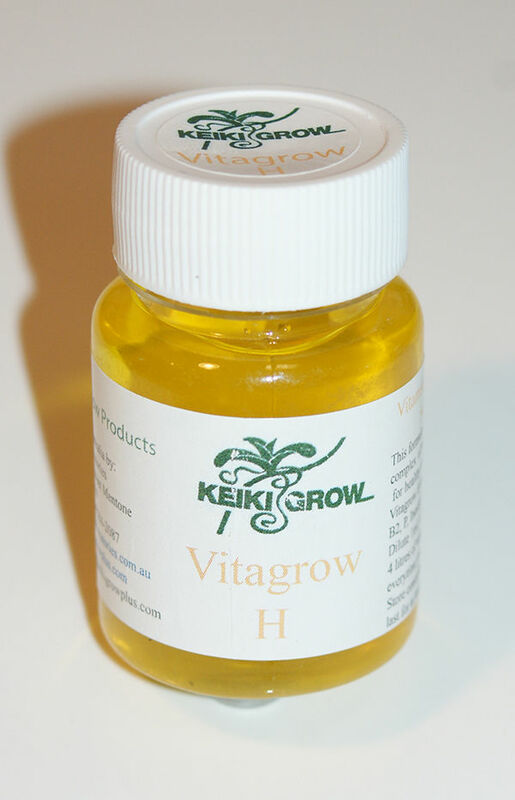 Vitagrow H contains Vitamins B1 (Thiamine HCl), Vitamin B2 (Riboflavin), Vitamin P (Niacin or Nicotinic acid), Inositol and auxin hormones in a specific ratio. These vitamins are standard ingredients of orchid flasking media and their absence in plant cultures or in composts hinders normal growth. VITAGROW-H is not a fertilizer but promotes the optimum response to your standard fertilizer program. It is especially useful during cool periods when fertilizer requirements are minimal but when healthy growth and active roots should be maintained. DIRECTIONS: Add 1mL per 4 Litres of of your regular fertilizer mixture. Add every time you normally fertilize your orchids. Note: Keep away from children and pets. Use only as directed. Shake well before using.